Yikes! The MediaSmart Server has been chopped in half….or has it? Actually no. 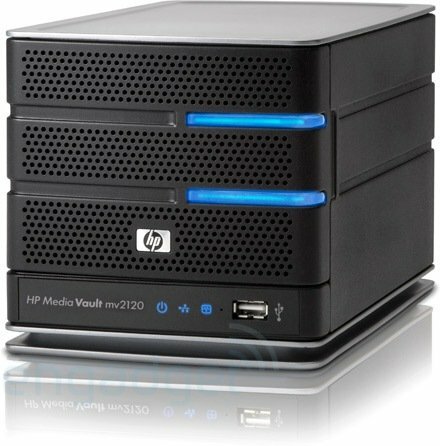 It’s the new Linux powered NAS device from HP known as the Media Vault. 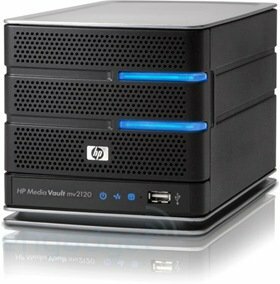 Available in 2 configurations the entry-level mv2100 comes with a 500Gb hard drive, and the mv5100 has two 500GB or 750GB drives. Additional capacity is available via two USB 2.0 ports and additional drives can be added for RAID 1 capability also. Gigabit Ethernet, and DLNA / UPnP networking (as well as direct-attached mode) are as standard. Both also include 2 GB of offsite, online backup. Pricing is TBA for the mv5100 but the mv2100 is expected to retail for $299. Both will be available in March. This will be the way to get linux into the home. Cute little functional boxes that anybody can use. I thought about finding a manufacturer myself to build a nice eye-pleasing case for something like this. I’m glad HP is taking the lead. Sounds very interesting! 1.5 TB NAS will be welcomed by many home users too! Only, HP should have done a better job with the appearance, as it’s obvious in how it appears to be chopped in half with that way stupid looking top panel which isn’t even the same color! It reminds me of a can of tuna! So cheap looking! Wouldn’t it make more sense just to use the Linux distro on the four bay model here, or at least offer the CHOICE? Who wouldn’t want to add additional hard drives for storage some time ahead? It would be even nicer to have additional hard drives for the support of RAID-5 too! This sends the wrong message about Linux, as if it has to be smaller and less able to do whatever. It appears HP is limiting Linux here, when it should be unrestricting it’s performance. What a pity!